Contestants: Chef Chelsi Hogue, from Ed’s Southern Bar and Grill in Goldsboro will compete against Chef Ben Adams from the Piedmont, a restaurant in Durham. At stake is a grand prize of $2,500 and a coveted red chef jacket. Topo Distillery and the North Carolina Beer Guys supplied drinks. I loved my spicy Bloody Mary again last night. While we were waiting a basket of bread supplied by La Farm Bakery was placed on our table. 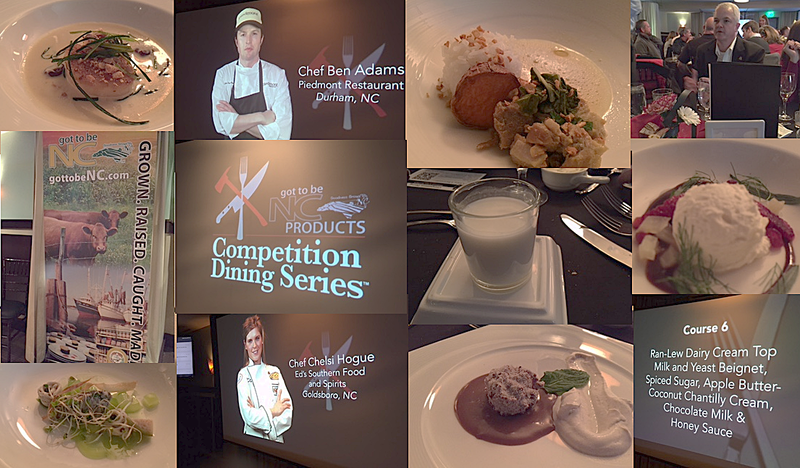 I was sitting next to Jennifer Noble Kelly, publicist representing La Farm Bakery and Chef Ben Adams from the Piedmont Restaurant and Amanda MacLaren from Durham Magazine. First Course: Pan-Seared Scallop, Aromatic and Spice infused Ran-Lew Dairy Cream Top Milk Broth, Creamed Parsnip, Pinot Noir plumped Cherries, Crushed Cashews and Fried Leeks. Chef Hogue, of Ed’s Southern Bar and Grill prepared it. It received a score of 28.66. Second Course: Anchovy, Little G Farms Bibb Lettuce Puree, Caper Berry, Marcona Almond, Crispy Parsnip, Ran-Lew Dairy Whey Cucumber Vinaigrette. Chef Adams of the Piedmont Restaurant prepared this dish. It received a score of 23.57. Fourth Course: Ran-Lew Cream Top Milk Braised Heritage Farms Cheshire Pork, Curry Scott Farm Fingerling Sweet Potatoes, Black Garlic, Herbs – prepared by Chef Adams, with a score of 24.77. Fifth Course: Ran-Lew Cream Top Milk Ricotta, Blood Orange, Pomegranate Seed, Fennel Black Current Puree – repaired by Chef Adams with the score of 27.39. Sixth Course: Ran-Lew Cream Top Milk and Yeast Beignet, Spiced Sugar, Apple Butter Coconut Chantilly Cream, Chocolate Milk and Honey Sauce – repared by Chef Hogue with a score of 27.08. The winner was Chelsi Hogue from Ed’s Southern with a score of 27 with a close win against Chef Ben Adams with the score of 25.27. I had a great time. Both Chefs out did themselves with their creations. We had a great crew at our Table 4; Jennifer Noble Kelly, Amanda McLaren, Marcus Hall and his wife, owners of The Cowfish Sushi Burger Bar, Mike Turner Director of Sales of Pate Dawson, Leah Carter, Chef Spencer Carter, Bo and Vanessa. I plan on attending the battle on Feb. 2: Spencer Carter of the Weathervane Restaurant in Chapel Hill, versus Rhett Morris of Rhett’s Restaurant in Southern Pines. Chef Carter assured me that he would be preparing 3 outstanding courses.